Last year, we announced that we were building a new talent analytics solution called LinkedIn Talent Insights – a tool that will help you answer questions like: which companies are you losing talent to? How does your employer brand compare to your peers? What’s the best location for you to open a new office? Today, we’re thrilled to share that Talent Insights is here. This is our first self-serve data product that taps into LinkedIn’s network of 575M+ professionals, 20M+ companies and 15M+ active job listings to empower you with the insights you need. Deliver data on demand: give HR leaders and talent professionals the ability to answer complex talent questions in minutes. Make the insights actionable: ensure that anyone can interpret the data. 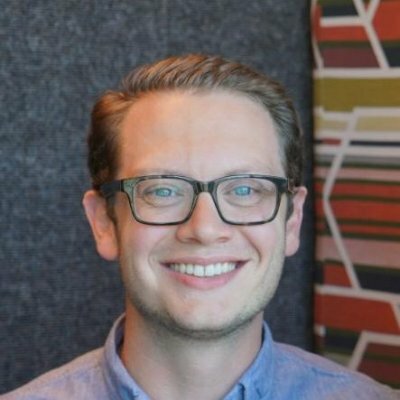 You don’t have to be a data-scientist to get immense value from the product. 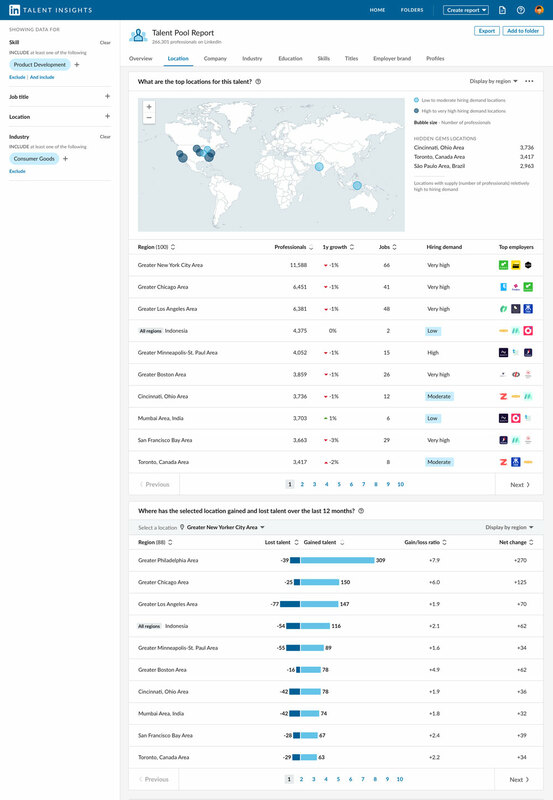 Harness real-time updates on LinkedIn: provide the most accurate view of labor market trends at any given moment. To make sure we delivered on these priorities and developed a product that would have far-reaching impact, we tested Talent Insights with more than 80 customers and users at every level in talent organizations—from people analytics leaders to TA managers to employer branding professionals. And, we were excited to see Talent Insights drive success across every role, region and industry – from mining and construction to insurance, telecom, software, finance and many others. Intel used Talent Insights to inform their employer branding strategy in Poland by getting insights on the best locations to place billboards near competitor’s offices. A fast-growing startup in the UK analyzed available talent pools in China to identify where they should open their new office. These are just a few of the many ways in which Talent Insights is informing business decisions for companies around the globe. 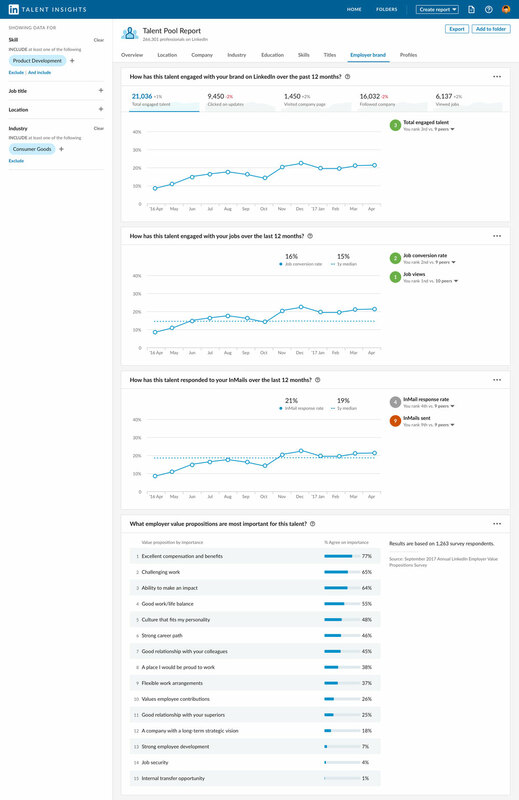 Talent Insights is comprised of two reports, which include unique cuts of data to help you with anything from peer benchmarking and retention analysis to university recruiting. The more you know about the talent you are trying to hire – where they’re located, who’s employing them, what skills they have – the better you and your teams will be able to recruit. 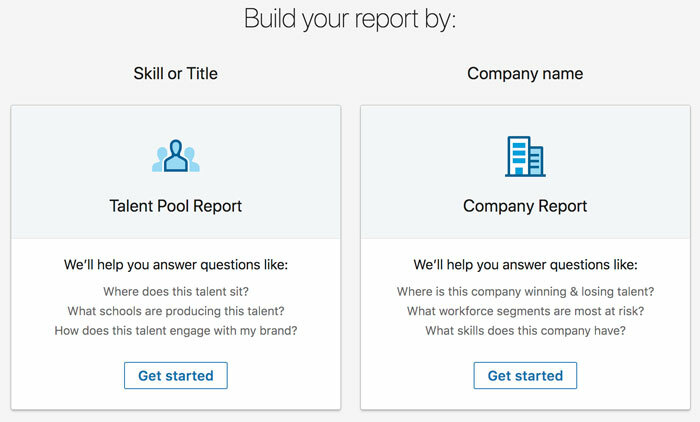 The Talent Insights Talent Pool report provides deep insights into your target talent. In this example, you’ll see that New York, Chicago, and Los Angeles each have a large supply of product developers; however, these cities also have very high hiring demands. Cincinnati, Toronto, and São Paulo, Brazil, on the other hand, are hidden gems to consider targeting because they have a good supply of product developers relative to hiring demand. When it comes to workforce planning, you can leverage both the Company and Talent Pool reports to get a holistic view of labor market trends in order to determine your company’s priorities. You can start by using the Company Report to understand the locations, roles, and skills that are growing fastest at your company. And, you can also see the same things for your competitors. For example, you might notice a competitor is adding a critical emerging skill to their product development team at a faster pace than you, signaling that you need to accelerate hiring for that skill and start developing the talent you already have. You can compare this to your own company's growth in that skill area to determine whether you may be leading or lagging the market. You can use the Company Report to get more information on talent at both your own company and your competitors in order to help you make more strategic decisions. The “titles” tab will tell you things like how many electrical engineers Flexis has compared to you as well as how tenured and experienced their workforce is compared to yours. The “talent flow” tab will show you where their employees are coming from or going to and what regions they are recruiting from most. The “skill inventory” tab reveals what skills are high in demand at Flexis and how many people with specific skills they have, which can help inform what skills you might need to hire to stay competitive. The “attrition” tab shows you how your attrition rate for specific titles and skills compares to that of your competitors. The “education” tab shows which schools your competitors recruit from the most, what their employees studied, and what degrees they have, so you can refine your campus recruiting strategy. With data from the company report, you can finally know where you stand with competitors, and adjust your strategies accordingly. A strong employer brand can help you find and hire talent more efficiently. Access to insights on the relative strength of your brand as well as a deeper understanding of what matters most to target talent offers a clear competitive advantage. You can find this information in the “Employer brand” tab in the Talent Pool Report. 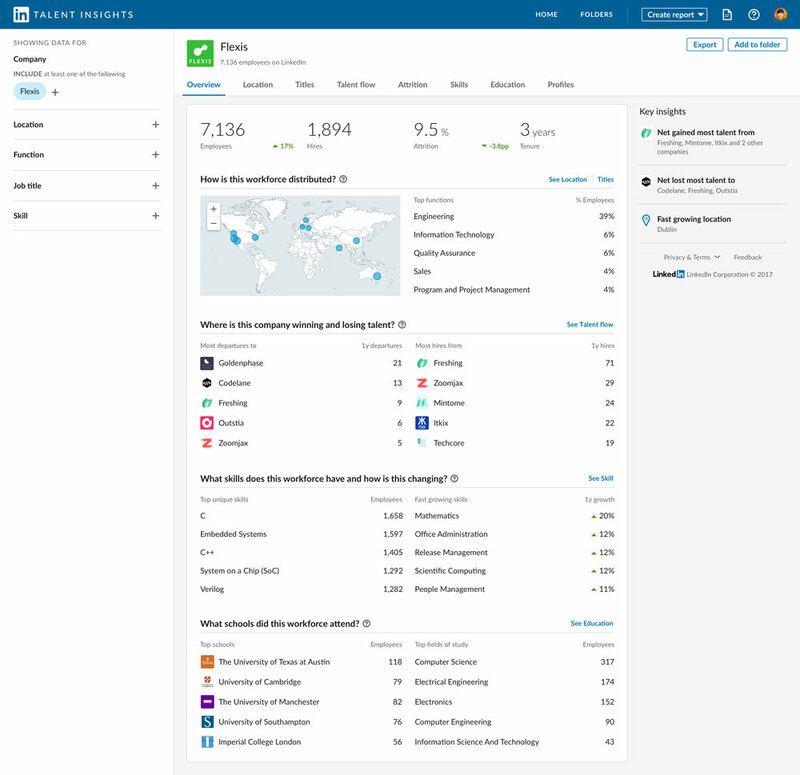 Here you’ll see how talent is engaging with your brand on LinkedIn based on how many updates they’ve clicked on, how many times they’ve visited your company page, if they’ve followed your company, and how many jobs they’ve viewed. 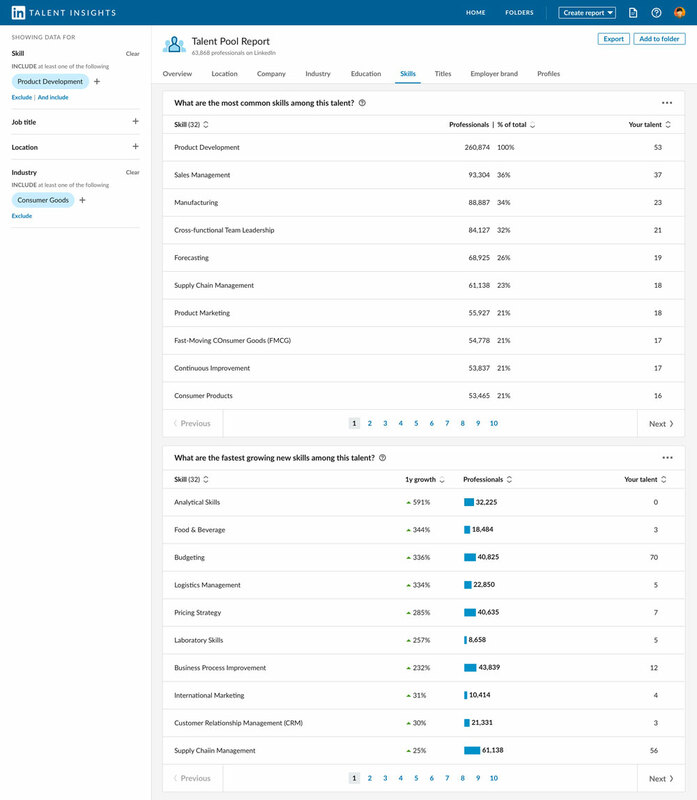 This tab tells you how likely you are to win talent within a talent pool and also helps you develop messaging for campaigns as you are able to see what's most important to that audience. As you can also see in the example above, Talent Insights helps you understand how likely you are to win talent within a talent pool. It also helps you develop messaging for campaigns as you are able to see the most important employer value propositions by talent pool. In this case, electrical engineers care most about compensation and benefits followed by challenging work. This knowledge can help you adjust your job description and pitch accordingly and inform what aspects of your culture you should emphasize. When it comes to making big decisions like where to open a new office, the Talent Pool Report will give you the insights you need. For example, in the same way that you informed your recruiting strategy in use case #1, you can use the “location” tab to understand which countries, regions, or even cities have a large enough supply of talent in your core job functions to support expansion. You can also view demand for the same talent in that region to assess how tight that labor market is. You can then use the “employer brand” tab to check how your employer brand is doing in that region. In addition, you’ll want to understand what your competition looks like in the locations you’re considering, and you can use the “company” tab to see who are the top employers in those markets and determine whether or not you will be able to compete against them. In this era of talent intelligence, these are just a few of the ways you can use Talent Insights to take the guesswork out of big decisions and get the perspective you need to plan for the future. We can’t wait to see how you use Talent Insights to elevate your hiring strategy and make talent decisions with confidence.